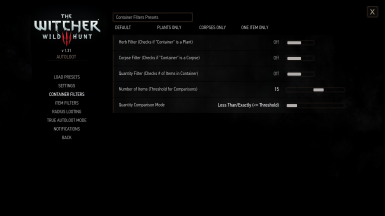 A complete optimization/rewrite (with permission from the authors JupiterTheGod and CarbonAlabel) of AutoLoot Standard/Enhanced editions, with all aspects configurable through in-game menus. This mod also implements the new "True AutoLoot Mode," an absolutely hands-free looting system. Combined the crafting/alchemy items filter into "Ingredients"
Added xml code to change the AutoLoot Radius hotkey in-game. Added instructions for installing this setting. 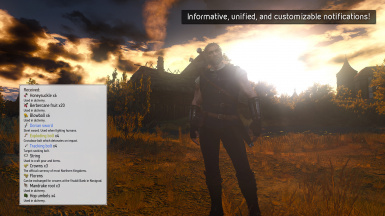 For those of you new to AutoLoot (originally by JupiterTheGod), it streamlines the looting process in The Witcher 3. Items that you wish to always pick up will now be automatically looted from all containers. 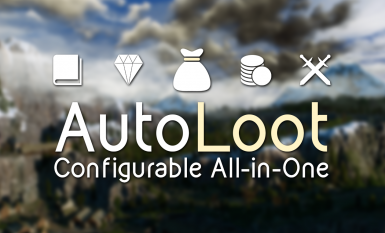 This mod builds on the strong foundations of AutoLoot and AutoLoot Enhanced (by CarbonAlabel) to create a unified, optimized, and customizable experience for AutoLoot. 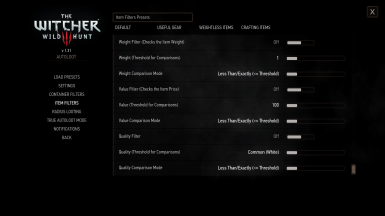 This mod aims to completely remove the necessity for "special versions" of AutoLoot, as well as the need to edit code to get your mod to do what you want. I've also taken some creative freedoms, with permission of the original author, and created new filters to cover items that were not originally part of AutoLoot. Finally, for those of you who do not want to be slowed down by the tedious looting of caves, houses, and the countless places that contain tons of containers, I've developed True AutoLoot Mode. 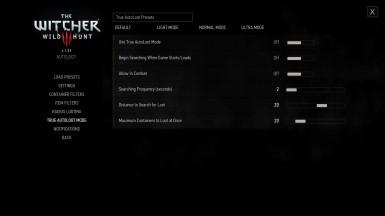 This mode continuously searches for loot that matches your user configuration settings, and picks it up, without any input/interaction needed from the user. Special care was taken to optimize this process, and I can say with confidence that I've finally gotten it to a point where this is no performance impact from using this feature. I actively monitor for suggestions, bug reports, and feedback, so if you think something is missing, should be changed, or have found an issue with the mod, please post your thoughts! True AutoLoot Mode: activated by hotkey, this mod will loot everything you specify indefinitely (no need to continue pressing buttons or interacting with containers) -- the same hotkey will disable this mode. This feature has no performance impact! I plan to work on a sort of "no cheating" option for Radius Looting and True AutoLoot Modes. This option would not allow this mod to loot items that the player can't get to (like items underground or in a building that you aren't inside of). It is proving difficult to figure out but I will continue working on it (this is a feature I personally really want to use). FIRST TIME USERS: Make sure to at least load a game and see the "Default settings loaded" or "Update installed" message before configuring your preferences, otherwise they will be overwritten. This is not required, but you will not be able to use Radius Looting if you choose not to follow this section. True AutoLoot Mode will only be usable by opening the menu and manually setting it to ON. 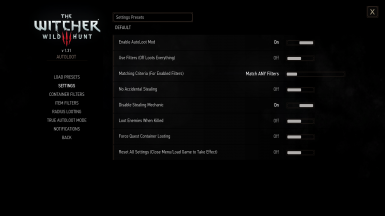 The only new input actions are under the [Combat] section. If you've already added the other actions to your input.settings file, do not add them twice. If do this and you try to adjust your keybinding in the settings menu, the key will change in the menu but will not work in-game. This is not required, but you will not be able to change your keybindings in the Settings menu if you choose not to follow this section. Q: Will this mod work on 1.X version of the game? A: This is intended for versions 1.30 and 1.31. Anything before that will not compile. Q: Why is True AutoLoot Mode and/or Radius Loot picking up items behind walls and below ground (like in caves)? A: This is due to the way the mod is searching for containers to loot. These functions implement a spherical area to search for containers -- and there is not a currently known method of determining what "accessible means" (to some, this might mean if you can walk to it, but to others this might mean in the same building). Collision detection does not seem to work properly on containers either. I am still working on a method to adjust this behavior. 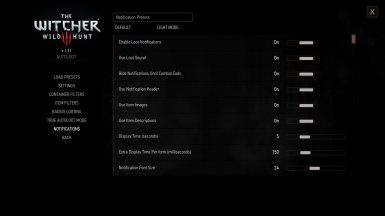 Q: Can I use this mod without installing the menu? A: No. 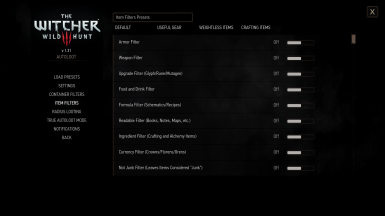 All functions within this mod rely on the values set by your menu options. Additionally, there is no way to save settings to the configuration file if the menu is not installed (this is inherent game behavior, nothing this mod can do about that). I do not plan to make a non-menu version. Q: Do I have to follow the keybinding instructions (marked OPTIONAL)? A: As indicated above, no you do not. However, if you don't follow the input.settings section, you will not be able to use Radius Loot. Additionally, you will be required to manually change the "Use True AutoLoot Mode" setting to ON in order to use that feature. If you do not follow the input.xml section, you will not be able to adjust your keybindings with the in-game Settings menu. Q: After remapping my keybindings in the Settings menu, why are they not working? A: You most likely have conflicting actions in input.settings. Open that file located in Documents/The Witcher 3, and search for either (Action=AutoLootRadius) or (Action=ToggleTrueAutoLoot) -- whichever keybinding isn't working. If you have duplicates under the same [Section], delete the additional entries (they will most likely be one after the other). 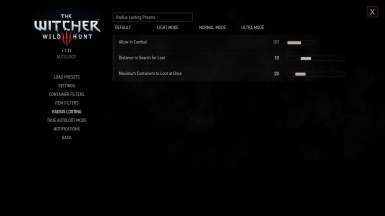 Save input.settings and rebind your key in the Settings menu. Q: I'm getting compile errors like in this picture, help?! A: First and foremost, these compile errors are not caused by this mod. You are using an outdated mod in your load order that is causing these compile errors. Recheck and update your mod list, and re-merge your scripts with script merger and try to compile again. I have moved this section to its own article to cut back on the length of this page. Click here to view the ReadMe or check the Articles tab. The new console commands have two formats, one with the "ahdal_" prefix, to indicate they're for use with this mod. These commands will have no affect on your game settings or other mods. The second is commands without a prefix. These commands are not unsafe to use, but if you use parameters for other mods, or settings from vanilla config menu items, it is possible to change those values outside the scope of this mod. Again, it's difficult to mess up your settings, but just be careful when/if experimenting. Pink/purple parameters are REQUIRED, blue parameters are OPTIONAL (as indicated). I don't believe quotes or apostrophes are required to use these functions (I believe the console automatically casts the parameter to the required data type). Resets all settings to their default values. This is the same as selecting the "Full Reset" option in the Settings menu. You will get a banner across the middle of the screen indicating the default values were successfully loaded. 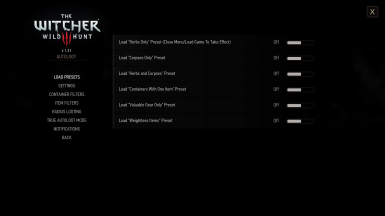 Example: ahdal_loadpreset( loadPresetHerbCorpse ) --> Loads the settings for "Herbs and Corpses Preset"
Clears all information stored in the AutoLoot notification manager. This command will display a notification in the lower left for 7.5 seconds indicating what was cleared. 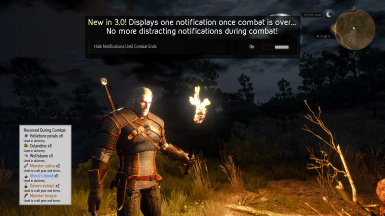 If you are out of combat, this should almost always give you 0.000 for everything -- the only exception is if you use this in the middle of combat, or somehow execute this command in the split second it takes Radius Loot/True AutoLoot to loot containers. Gets the value stored in the config wrapper class (pulls from your user.settings file) under the section [group] for the variable named setting (this is meant for debugging to check certain values of XML menus without opening the menu, which could trigger other functions). Optionally, you can provide an integer time to indicate how long (in seconds) to display the notification with the parsed information. All parameters are case-sensitive. Sets the value in the config wrapper in the section [group] for the variable named setting with the value val. Optionally, you can provide an integer time to indicate how long (in seconds) to display the notification with the parsed information. Additionally, you can optionally provide a bool value (true/false) for save to indicate whether or not to save this value to user.settings (the difference between the two is without a true value for save, the value will not persist if you don't save your game). Displays a notification with X, Y, and Z coordinates of the player's position (by default uses GLOBAL coordinates). You can pass the string local for the mode parameter to indicate using local coordinates (I'm not sure what the difference is between global and local coordinates, could be something to do with different world states). You can pass a bool value showTarget to indicate also displaying your target's coordinates (this is a bit misleading -- the "target" is your current entity focus, like a container, candle, or door; I don't believe this works with enemies). Finally, you can optionally provide an integer time to indicate how long (in seconds) to display the notification with the parsed information. You will likely have to make one or two merges with Script Merger in playerWitcher.ws. I have tested with many popular script based mods such as Friendly HUD, Immersive Cam, The Enhancement System, etc., and it is indeed working. If you're having trouble with compile errors after merging, please watch the video below. JupiterTheGod, original author of AutoLoot, for allowing me to make these modifications and use the original framework!